�Color is the visual sensation, associated with a part of the field of view that appears to the eye to be without structure, through which this part can be distinguished from another unstructured neighbouring area when observed with a single, unmoving eye�. This rather complicated but unambiguous definition of color allows the visual sensation of �color� to be distinguished from all the other impressions received when seeing. The insertion of the term �unstructured� into this definition also separates the texture of observed objects from the sensation of color. Thus the texture of a textile, for instance, is not included in the color. The definition also calls for observation with a �single� eye which is �unmoving�, conditionally excluding other factors such as spatial sensation, the perception of the location of objects, their direction, and even their relative movement from the perception of color. Since single-eyed observation of an unmoving object with an unmoving eye does not allow for the perception of gloss, the evaluation of gloss is excluded from the perception of color. In general, unlike mass, volume or temperature, color is not merely a physical property of an object. It is, rather, a sensation triggered by radiation of sufficient intensity. This can be the radiation of a self-emitting light source, or it can be reflected from a surface. This radiation enters the eye, where receptive cells convert it into nervous stimulation, which is in turn transmitted to the appropriate part of the brain, where it is experienced as color. The sensation of color depends not only on physical laws, but also on the physiological processing of the radiation in the sense organs. Visual conditions, luminance (brightness) and the state of the eye�s adaptation are amongst the contributory factors. Color manifests itself in the form of light from self-emitting light sources, surface colors (of non-self emitting light sources) and in the intermediate form of the luminescent colors of dyestuffs such as optical brightening agents and day-glow paints that absorb photons from a short wavelength part of the spectrum and emit the energy in a part of the spectrum with longer wavelengths. From the fact that spectral decomposition of white light produces the perception of different colors, it can be deduced that color perception is closely connected to the wavelength of light (Fig. II.17.). As an example, light with a wavelength of 650 nm wavelength is perceived as �red� and light with a wavelength of 550 nm is perceived as �green�. However, there are colors, such as purple, which cannot be directly related to a certain wavelength and therefore do not occur in the spectral decomposition of white light. The perception of color is formed in our brain by the superposition of the neural signals from three different kinds of photoreceptors which are distributed over the human eye�s retina. These photoreceptors are called cones and are responsible for photopic vision under daylight conditions. Scotopic (night) vision is caused by photoreceptors called rods, which are much more sensitive than cones. As there is only one kind of rods, night vision is colorless. The three different kinds of cones differ in their spectral sensitivity to electromagnetic radiation, which is shown in Fig. for the average normal sighted human eye. If monochromatic radiation irradiates the eye, as it is the case with spectral decomposition of white light, the wavelength determines which types of cones are excited. 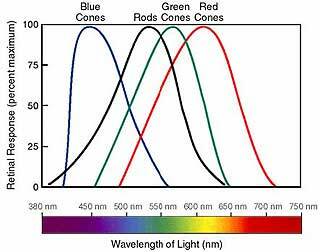 For instance, monochromatic light at 680 nm exclusively excites one type of cones, whereas the two other types are insensitive at this wavelength. The brain interprets signals from only this type of cones - in the absence of a signal from the other cones - as the color �red�. Therefore, these cones are called �red cones�. Similarly, the two other types of cones are called �blue cones� and �green cones�. As discussed above, monochromatic light of a certain wavelength might predominately excite a single type of cones, thus producing the color perception of �blue�, �green� or �red�. Depending on the actual wavelength, monochromatic light might also excite two types of cones simultaneously, thus producing the perception of another color. Red and green cones, for instance, are both excited by monochromatic light of 580 nm, and a signal from these two types of cones � with the simultaneous absence of a signal from blue cones � produces the color perception of �yellow�. However, our visual system cannot discriminate between monochromatic and broadband radiation as long as the excitation of the three types of cones remains the same. Thus, the perception of �yellow� can also be produced by a broadband spectrum between 550 nm and 700 nm as long as green and yellow cones are comparably stimulated and blue cones are not stimulated at all. Similarly, the perception of �cyan� is produced by simultaneous stimulation of blue and green cones, whereas the perception of �magenta� (or purple) is caused by simultaneous stimulation of blue and red cones (Fig. II.17). Simultaneous stimulation of all three types of cones results in the perception of �white�. This fact has an important consequence: Consider a light source consisting of three single sources with the colors red, green and blue. If it is possible to vary the intensities of the three single sources individually, all possible colors can be produced. This is the main idea of color cathode ray tubes commonly used in TV and computer monitors - every pixel (a point on the monitor) consists of three smaller individual spots in the colors red, green and blue (Figure II.18). As these individual spots are so close together, the human eye cannot resolve them. Instead, they produce the perception of a certain color by superposition of their respective intensities. For instance, the pixel appears yellow when only the red and the green spot are emitting light, and the pixel appears white when all three spots are emitting light. The entirety of colors produced by color addition forms the RGB color space, as they are based on the three (additive) primary colors red, green and blue. Fig. II.18 - The effect of color addition demonstrated with white light from an overhead projector before (top) and after (bottom) passing through a magenta filter. To the left, the respective spectral decomposition is shown, whereas the circle to the right shows the resulting color impressions. It can be clearly seen that the filter strongly absorbs light from the green part of the visual spectrum, whereas blue and red light pass the filter with low attenuation. The impression of magenta is produced by simultaneous presence of light from the blue and red regions of the visible spectrum, whereas light from the green region is missing. Fig. II.19 - An RGB monitor consists of tiny red, green and blue spots. Variation of their brightness produces the impression of different colors by color addition. Whereas color addition describes the perception of different colors caused by a superposition of red, green and blue light sources, the concept of color subtraction is based on the absorption of white light by filters or pigments. As an example, a yellow filter absorbs wavelengths below about 500 nm, corresponding to blue light, but transmits longer wavelengths corresponding to green and red light. Thus, when irradiated with white light the filter transmits only wavelengths which stimulate the green and red cones, whereas the blue cones are not stimulated. As discussed above, this results in the perception of the color �yellow�. Similarly, a surface (better: pigments on a surface) absorbing wavelengths below about 500 nm and reflecting wavelengths above appears yellow when irradiated with white light. So, when irradiated with white light filters (or pigments) absorbing blue light appear yellow, filters (or pigments) absorbing green light appear magenta and filters (or pigments) absorbing red light appear cyan. As the effect of filters on transmitted light is the same as the effect of pigments on reflected light, the following conclusions derived for pigments are also valid for filters. What happens if two pigments are combined ? The combination of a yellow pigment, which absorbs short (blue) wavelengths with a cyan pigment, which absorbs long (red) wavelengths, leaves only medium (green) wavelengths to be reflected when irradiated with white light. So, the combination of yellow and cyan pigments results in green reflected light. Similarly, the combination of yellow and magenta pigments results in red and the combination of cyan and magenta results in green reflected light. In next figure, the effect of color subtraction is demonstrated for filters. Ideally, a combination of yellow, cyan and magenta pigments should result in total absorption of the whole visible wavelength range and thus in the perception of a black surface. However, in reality the absorption properties of these pigments are never ideal, thus four-color-printing uses a black pigment in addition. 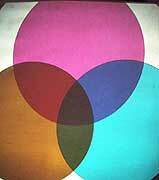 Colors produced by a combination of cyan, yellow, magenta and black form the so called CYMK color space. Fig. II-20 - Overlapping arrangement of yellow, cyan and magenta color filters on an overhead projector. In the overlapping regions, color subtraction results in green, red and blue light.